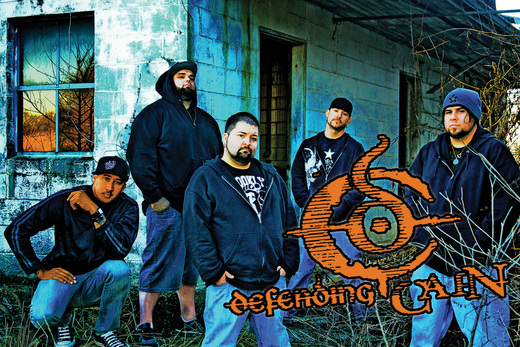 Defending Cain is a melodic and groove driven heavy metal band from the eastern panhandle of West Virginia. Although relatively new, Defending Cain's members have combined for over 30 years worth of shows and touring experience. A new family of musicians who pride themselves on creating a "different breed" of heavy music. Each member brings a unique musical background into the mix that helps put t...o rest the preconceived notions of what "metal" should sound like. Blending forceful dynamic vocals, driving guitar riffs and a high energy stage show, Defending Cain is quickly gaining attention around the Tri-State area. Individually, each member of the group has a strong history in the independent and local music scenes....sharing the stage with national acts from every genre including Hatebreed, Flogging Molly, Sevendust, 3 Doors Down, Soulfly, Periphery, 10 Years, Saliva, Dope, Kittie, the Clarks, Chimaira, God Forbid, Kings X, Bret Michaels, Hed PE, P.O.D., Motograter, Ill Nino, Otep, Mushroomhead, the Mayhem Festival (Slipknot, Disturbed) and many more! A brief glimpse into the musical past of Brandon Wright (vocals), Jeremy Dove (guitar), Jason Hurst (guitar), L.G. Thompson (bass), and Mike Snyder (drums) should make you contemplate what lies ahead for the combined sound of Defending Cain.